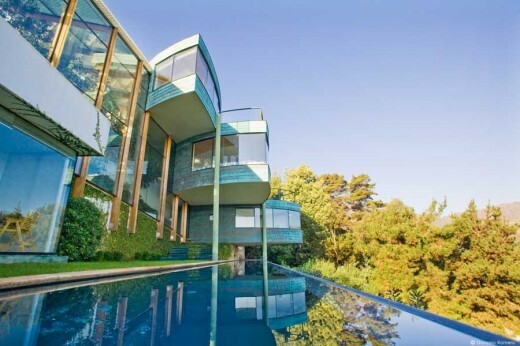 The site of this holiday house is long and very inclined. It falls from the North to the South. On its upper edge it sits on a road that unites different seaside towns. 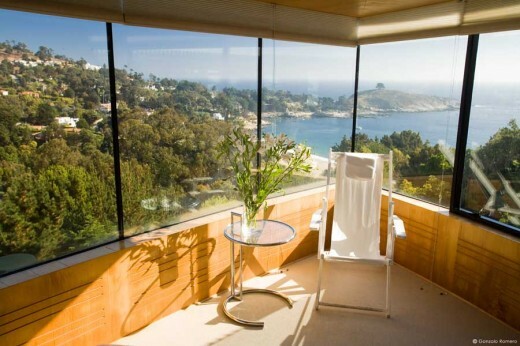 From the upper section it offers splendid views of the seaside resort and of the bay. However, the tree filled site had many problems. Because it falls to the south it received very little sun, since in Chile the sun passes on the north. There was also a big house on the west, from which one had to separate oneself from in order to get views of the sea. Additionally, the regulations obligated the construction to take place under a height limit of 7.5m. These conditions lead the house to be located as high in the site as possible and as close to the upper road as possible, and to be located to the east, searching for the sun and the views. It also lead to decomposing the program in different volumes with these same objectives, adapting to the height limit. 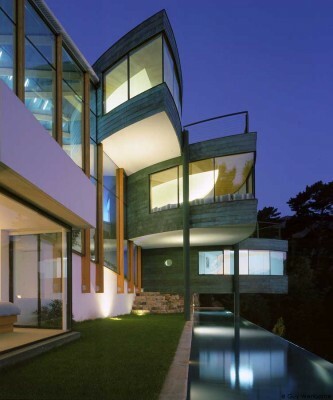 The floor-plan of this house resembles a branch of pine or eucalyptus, whose stem would be an inner garden with trees. This greenhouse cheers up the house and includes the ramps that unite the levels, which are useful to disabled people. It includes different programs, which are barely noticeable, such as entry hall, a sauna relax area, etc. The garden is heated from the above and by the windows towards the north, generating a “greenhouse effect” that warms the house. This passive thermal system has functioned very well. The house hardly needs artificial heating translating into energy savings (see figure). The weather is benign, with an average maximum of 20,8 ºC and a minimum of 9,2 ºC. However, at nights heating is necessary. The consumption of gas for heating in the cold months (March to October) has adjusted itself to the annual average and is decreasing. The fact that the winter consumption is below the average for two years is not strange, due to the greater use of the house in the summer, since gas consumption includes some kitchen artifacts. Towards the road the house is perceived at night as a horizontal light fixture. Towards the slope the house opens up explosively through its 3 “boats” or overlapped “leaves”. 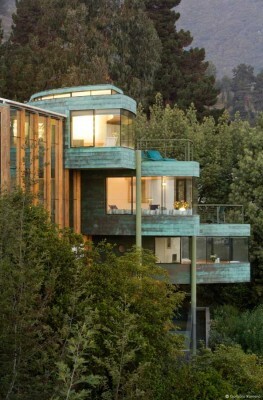 Given the point of view, the house seems to fly over the site or, given its green copper cladding, it merges with the landscape. Furthermore, the use of the copper alludes to the main Chilean exportation. Given its ramps the house offers a great variety of routes and visions. These additionally contribute to the land-retaining wall. The program was divided into three “leaves” overlapped and rotated. The main bedroom is above. In the intermediate level is the living room – dining room and further down are the kid’s bedrooms. A guest bedroom was located on the other extreme of the house. 23/11/09.